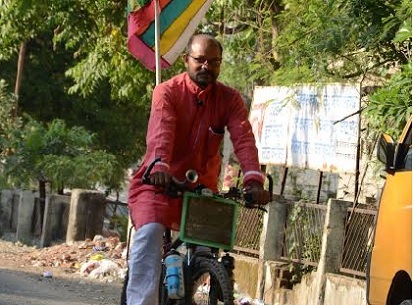 Bhopal: He is a solo campaigner pedaling across the country, trying to find answers to gender discrimination and disturbed gender equations in the country. But after traversing through ten states and mapping about 16,000 km on a bicycle to interact with over 4.5 lakh people on the issue, Rakesh Singh of Bihar, is yet to find any specific answer to his quest. “Rather, there are many gender related points on which I get stuck now after two years of my journey. Earlier I would easily gloss over them,” Singh said in a reply to a query by NewsBits.in. Singh was participating in a discussion session organized by NGO Vikas Samvad. The campaigner, who started his ‘ride for gender freedom’ cycle trip across country in March 2014 after getting involved with issue of acid attack, feels that his journey till now has broken his perception that things were better off in South India compared to northern areas. “The issue is equally complex and inherent in all parts of the country. And since women are more involved in revenue generating employment activities in south India, the situation is perhaps more complex there,” Singh said. Though the campaigner said that he found participation of women in socio-economic activities the best in Kerala among all states visited, it did not mean that there was gender equality prevailing at domestic level. “Kerala is the dowry capital of the country,” he said. Starting his journey from Chennai in Tamil Nadu, Singh has till now covered states like Kerala, Karnataka, Puducherry, Andhra Pradesh, Telengana, Bihar, Uttar Pradesh and parts of Nepal too. As for Madhya Pradesh, Singh shared that he has visited Shivpuri-Sheopur, Guna and Bhopal till now and the highlight was the unusual harp on caste identification and the prevalence of veils among rural women. “I haven’t been asked my caste at many places including temples, but in North MP, people were very insistent about my caste. One policeman in Sheopur called up my father when I did not reveal my caste identity,” he said. The campaigner said that while he did not aim at societal reform through his journey and rather sought to understand the various aspects of issues himself, it gave him pleasure when he saw small positive reactions and changes after his interaction with people. “Many women told me it was their last Karwa Chauth fasting after I interacted with them and asked stinging questions like – doesn’t your husband care for your health and long life,” Singh recounted. A group of college girls in Patna started an agitation against sexual harassment by a teacher few days after his interactions session. Children would promise to find out what their mothers ate and why they ate at last. He targets different sections of society and tries to raise issues through points close to their hearts. “In India, the best way to communicate is to directly aim at heart of the people. Thankfully I learnt this art over a period of time,” the campaigner said. Singh plans to continue his journey till October 2018 and culminate it into a youth festival on gender issues at his home town Tariyani Chhapra (Sheohar district, Bihar). Sachin Jain of Vikas Samvad made the introductory remarks while Rakesh Malviya conducted the proceedings.